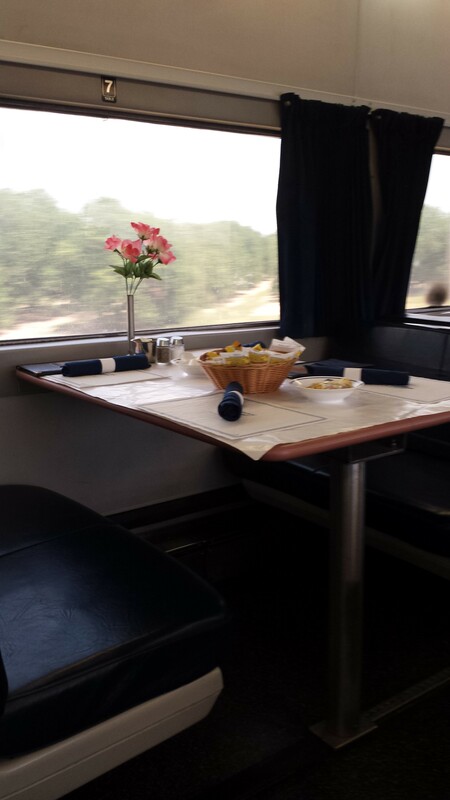 After spending a couple of days at the Magic Kingdom and Epcot Center at Disney World as well as Universal Studios Florida in Orlando, I decided to take the Amtrak’s Sliver Service Silver Star instead of driving home. This is my first time riding the Silver Star; I have ridden the Silver Meteor several times. Before proceeding to the Amtrak/Sun Rail Station in Orlando I had breakfast at the world largest McDonald’s Restaurant which has a bowling alley. While waiting at the Amtrak/ Sunrail Station for the Silver Star# 91 to arrive from New York, which was now 38 minutes late due to other train interference from other trains( …ie Sunrail, other Amtrak trains and freight trains), the 1054 am Sunrail train from DeBray,Fl arrived. It had the Cab control car leading with two coaches and the loco pushing. 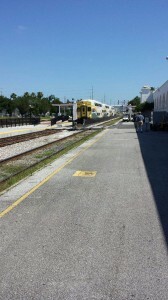 The Sunrail trains use the north end of the platform (pictured) where the ticket vending machines are located. A handful of passengers got off and on for the midday Sunrail train. Five minutes later, The Silver Star #91 arrived. Approximately 40-50 passengers got off, and another 30–40 passengers got on which is pretty good for mid -week. The Orlando Amtrak/Sunrail Station and the Tampa Amtrak Station serve thruway buses as well to the West Coast of Florida. I had my ticket scan on the platform using my smart phone, the first time I have used the smart phone on Amtrak. After some station work, we highballed to Tampa. We encounterd some slow orders to Kissimmee,Fl. After a quick stop at Kissimmee we continue on to Tampa, and because of these slow orders we ended up adding 27 mins to our late train. The track speed from Orlando to Tampa is 60-79 mph. 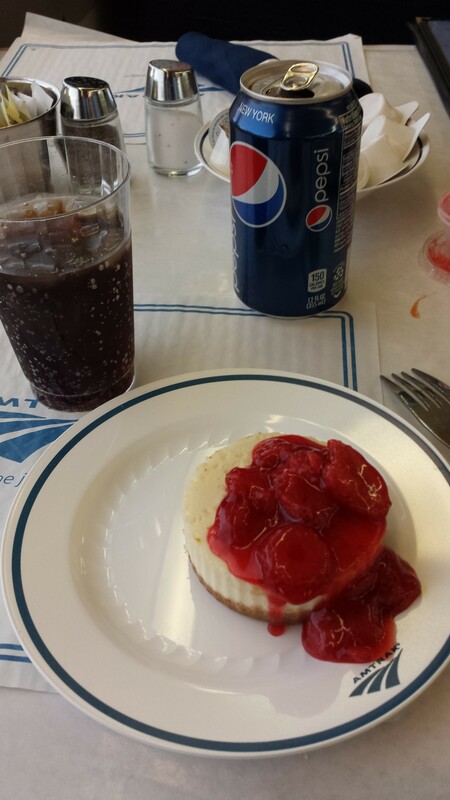 The LSA from the dining car came through the coaches for lunch reservations. I chose the 1230 reservation. the other choices were 1145, 1230, 1315,or 1400. For lunch, I ordered the Angus beef burger (pictured below, left) and the Strawberry cheese cake (below right) for dessert. 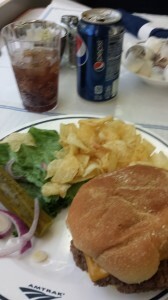 During lunch, my train met northbound Silver Meteor #98. At Tampa, the train does a backup move to the station. Approximately 100 -125 passengers got off and on at Tampa. The Amtrak station is located in the Ybor City area of Tampa, which is a redeveloped and historical area with plenty of hotels and restaurants located nearby and connected by a street car system. With everybody on board and a everyone had their smoke break, my train continued on to South Florida. The Silver Star stops in Lakeland, which has a nice new station, a stop at Winter Haven, which is the gateway to Legoland, Sebring, and at Okeechobee, which is the gateway to Lake Okeechobee and Everglades Recreational areas. Before Sebring , at Devon Park, my trains passed Northbound #92 Amtrak’s Silver Star. After having a pleasant, wonderful trip and a friendly crew on my trip on Amtrak Silver Star, I arrived 1h 05 mins late at Ft. Lauderdale, Amtrak/Tri-Rail Station. 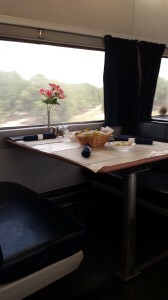 NOTE: I used the Amtrak Saver fare of $39 Orlando-Ft.lauderdale. If i used my car it would have cost $32 in gas and $12.00 tolls. Air would have cost $69-$563, or the Bus $30.00.